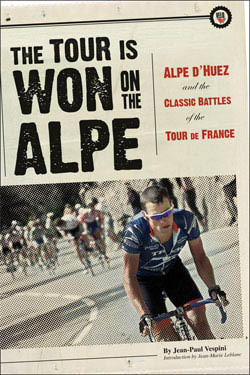 In time for July's Tour de France and its featured ascent of Alpe d'Huez, VeloPress has published The Tour Is Won on the Alpe: Alpe d'Huez and the Classic Battles of the Tour de France by cycling historian Jean-Paul Vespini. Each chapter covers one ascent, starting with Fausto Coppi's astonishing victory in 1952. Vespini tells the story of this celebrated climb and the mountain that so often acts as the ultimate arbiter for cycling's biggest prize. Vespini's riveting descriptions of each battle to the top include candid interviews with riders, new insight into epic rivalries, and little-known but fascinating facts about the climb that has become a rite of passage for every rider in the peloton. Cycling's most famous names are all present and accounted for: Coppi, Eddy Merckx, Bernard Hinault, Pedro Delgado, Miguel Indurain, Marco Pantani, and of course the American victors Greg LeMond and Lance Armstrong. The book is now available in bookstores, bike shops, and online. If there is one mountain climb that embodies the spirit and magic of the Tour de France, it is the Alpe d'Huez. Its 21 hairpin turns and average gradient of 8.1 percent over 13.1 kilometers have become legendary, changing the careers of Americans Greg LeMond and Lance Armstrong, and nearly destroying Jan Ullrich and Marco Pantani. Here at last is the definitive history and unforgettable story of cycling's greatest challenge. Author Jean-Paul Vespini has worked as a journalist for thirty years. He is a regular contributor to the cycling magazines Le Cycle and Cyclisme International. His books include a best-selling biography of controversial French cyclist Richard Virenque, and several cycling reference titles. He has covered the Tour de France since 1990. Translator David V. Herlihy is the author of Bicycle: The History (Yale University Press), and a former contributor to Bicycle Guide. - Paperback with color photosections. L'Alpe d'Huez is a featured stage in the 2008 Tour de France. The Versus television network reported that total viewership for the 2007 Tour was up 11% over 2006, reaching 20.5 million households. Color photo insert features highlights of this epic climb in 25 Tours de France.